in the old Austria Hungary or Austro-Hungarian Empire. Horvát-Szlavonország (Croatia, Serbia or the old Yugoslavia, and Slovenia). the former Kingdom of Hungary. Indexes for more than 35,000 village, place, community, settlement, town, and city place names in the old or former Kingdom of Hungary (pre 1919), including the area known as Horvát-Szlavonország (Belovar-Koros, Lika-Korbava, Modrus-Fiume, Pozsega, Szerem, Varasd, Veroce, and Zagrab counties). Includes place names located in the areas or regions commonly known as, or referred to as Banat, Batschka, Burgenland, Erdeley, Kartapalja, Ruthenia, Transylvania, Vojvodina, or Zakarpattia. Functions as a village finder, place locator, or town seeker when conducting a place name search. Uses official, native, conventional, variant, former, and current names to make finding or locating the village of interest a more likely probability. Offers church and parish information for locating birth, marriage, and death records for each town or village. Also includes reference maps for every county (megye/varmegye) and every district (járás), current country locations with names, as well as other relative information, plus research aids, hints, and “LINKS” to online/Internet websites. Complete reference for libraries, historical societies, schools, genealogists, and the home historian. Includes two complete alphabetical indexes of Croatian, German, Hungarian, Polish, Romanian, Slovakian, Slovenian, Ukrainian, and Yugoslavian/Serbian place names: 1) Index of PLACE NAMES (With Accents)... diatrics, and "special" letters when used and 2) Index of PLACE NAMES (No Accents)--allows for use of built in “FIND” tool without knowing where or how special letters were used and when searching for known “groups” of letters in place of whole names (see example). A real asset for help in deciphering difficult to read or misspelled village and town names from the Ellis Island database, naturalization records, or any other source. of the USA and Canada at this time. 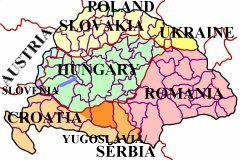 placenames / place names, towns, cities, villages, places, communities, settlements, districts, megyes or varmegyes in (the)--Kingdom of Hungary, Hungarian Empire, Austria Hungary Monarchy, Austro Hungarian Empire, old Hungary, or Hungary? gazetteer, atlas, dictionary of place names, village locator, place finder, town seeker, encyclopedia of settlements, or index of villages? Croatian, German, Hungarian, Polish, Romanian, Rusyn, Ruthenian, Slovak, Slovakian, Slovenian, Serbian, Yugoslavian, or Ukrainian ancestry, origins, heritage, or roots? Austria, Croatia, Poland, Romania, Serbia, Yugoslavia, Slovakia, Slovenia, or Ukraine? determining, translating, deciphering, or interpretting village names from the Ellis Island passenger records or ship manifests from the ellisisland.org website? and how to find birth, marriage, and death records for your ancestors? "Magyarorszag Helysegnevtara" by Janos Dvorzsak, over the past 7 years, many other sources have been researched, utilized, and compiled in an effort to offer the user as much help as possible. Unlike most book atlases and gazetteers covering the same area, the HVF contains place names / placenames in Croatian, German, Hungarian, Polish, Romanian, Slovakian, Slovenian, Ukrainian, and Serbian--along with alternate spellings, native names, official names, Magyarized names, old and new names, and former and current names. Also included are the names and locations of smaller settlements such as pusztas, csardas, tanyas, etc., ALL alphabetized using the Arabic alphabet (English) into single, comprehensive indexes. In other words, YOU do not need to know what language a learned place name is in order to locate it in the HVF! megye (county) indexes, or járás (district) indexes with a simple scroll of your computer's mouse. your trips to the library and/or LDS Family History Center more productive. or if you are trying to determine where to begin looking for local church vital statistics such as birth, marriage, and death records, you will want to add the power of this software to your genealogy resources today. Disclaimer--While every effort has been made to locate, index, and include all places in the 71 counties of the Kingdom of Hungary, neither the Hungarian Village Finder, Atlas, and Gazetteer for the Kingdom of Hungary, its owners, or the webmaster imply or express any warranties and/or guarantees whatsoever. Buyer and user understand and agree that many variables may prohibit their success in locating some place names. work on Apple or MAC computers. CD-ROM--This is brand new, factory wrapped software. When you purchase this software, you are acknowledging that you have read and understand the necessary SYSTEM REQUIREMENTS to install and run the software. No returns will be allowed due to buyer’s failure to read and understand these requirements. Only unopened, factory sealed packages will be acceptable for returns. Absolutely no chargebacks or refunds will be allowed or paid until software has been returned and received in unopened, unused condition. Return shipping and insurance shall be the responsibility of buyer. DOWNLOAD--When you purchase and Download this software, you are acknowledging that you have read and understand the necessary SYSTEM REQUIREMENTS to install and run the software. There will be no refunds or chargebacks allowed or approved once you have purchased the DOWNLOAD. Credit Card payments through PayPal only.